Vicarage in modern times (copyright Thomas Vooght professional photographer & former occupant of the house). 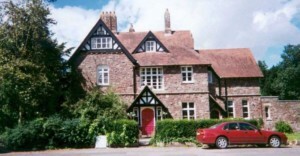 The Vicarage in this photograph was used by the vicars of Thornbury from 1896 until 1997. 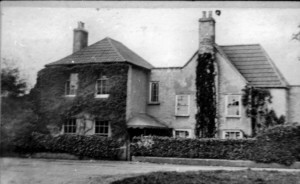 We know that there was at least one other Vicarage on this site prior to 1896 and we have a photograph of that not long before it was demolished. However the parish has a considerable history as evidenced by the documents held at Christ Church Oxford. 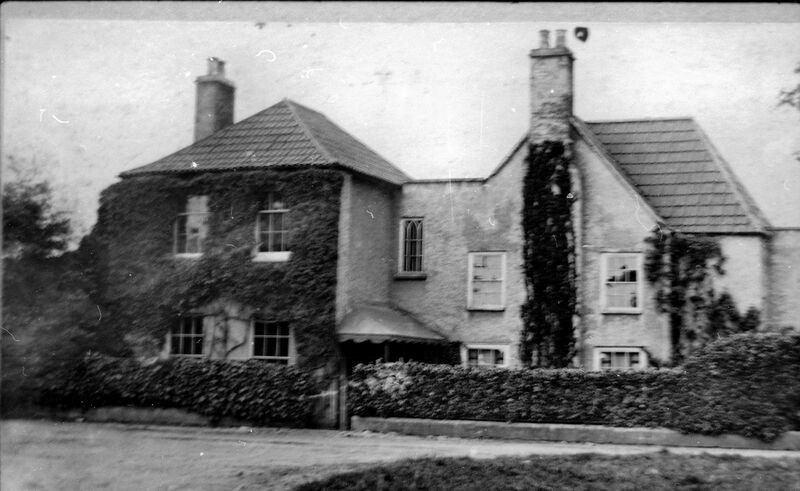 There is another building opposite the church now known as Glebe Cottage but previously known as the old parsonage. We had assumed that before this earlier vicarage was built the vicar lived in the old parsonage. However it seems that it was not as simple as this and that the “old parsonage” and the vicarage were both in existence in Thornbury in the mid sixteenth century and probably even before then. We have more work to do before we can be more definite about the earlier history of both sites. For the time being we can only describe what we know of the older building and how the Vicarage shown here came to be built. The parish of Thornbury was once attached to the Abbey of Tewkesbury. A decorative list displayed in St Mary’s Church in Thornbury shows that “the Abbot and Convent of Tewkesbury received an Indult dated 5 Kalens 122 from Pope Honarius II to enter and retain to their own uses when void the churches of Thornbury, Marshfield and others already granted to the Abbey by Pope Lucius (Larius III) on condition of their putting fit persons therein as Vicar“. We understand that it was the duty of the Abbott of Tewkesbury to send a chaplain to Thornbury every Sunday to celebrate service in the church. Apparently there is a record in the manor court of Thornbury of the Abbot being fined £5 for neglecting to send a chaplain and some cattle were distrained to enforce the penalty. The monastery at Tewkesbury was dissolved in January 1540 and its possessions surrendered to the Crown, including the rectory of Thornbury. In 1546 Henry VIII re-founded the College of Christ Church and it was at this time that the benefice of Thornbury amongst many others was transferred to Christ Church. To this day the website of St Mary the Virgin says that the patronage of the Parish of Thornbury is with Christ Church Oxford. This is reflected in the fact that the majority of the Vicars appointed to this church were graduates of Christ Church. We have little information about the very early Vicarages on this site at this time although we hope to find more. The earliest description of the parish of Thornbury that we have so far is from a survey of the rectory of Thornbury taken about 1550. This document held by Christ Church says that the church needed repairs. The chancel was in some decay and the roof needed to be renewed. The Vicarage however was said to be a “fair house” with a garden and orchard. The living was worth £30. When the Rev Richard Slade wrote to the Dean and Chapter of Christ Church about the Vicarage of Thornbury in November 1800, he was less critical, describing it a “ill-contrived but habitable” and said that it had an acre of garden, which is the only land belonging to the Vicarage at that time. In another letter held by Christ Church dated 1858 from the Rev M F T Stephens the house was said to have four bed rooms, a dressing room, dining and drawing rooms and a library. When the living of Thornbury was described in a second letter from Rev Stephens in July 1868 he says that the date of the erection of the “parsonage” as he describes the Vicarage that he lived in was unknown but that part of it was newly built about 50 years before then and that it has a shed, a cottage and stables. There was half an acre of garden and the cottage was let out at £9 a year. The house at that time presumably looked much as it does in the photograph on the right. By and large the Censuses seem to show that the Vicars who lived in the building in Victorian times appeared to have a fairly pleasant life style, certainly preferable to the gloomy picture painted by Horace Walpole. The 1841 Census for example shows that Maurice Fitzgerald Townsend Stephens and his two daughters had at least eight live-in servants to look after their needs. Subsequent Censuses show that until his death in 1872 he never had less than six people living in the house to look after him. This was probably a reflection of Maurice’s personal circumstances and family wealth. The Rev Thomas Waters who followed Maurice Townsend Stephens as Vicar had to make do with only three servants actually living in the house. On 24th February 1873 he requested permission to spend £750 on repairs to the Vicarage and for consent to borrow £400 of this from the charity Queen Anne’s Bounty. The Dean and Chapter replied quickly that they would like to see the details as they did not think so large a sum should be built patching a bad house up. It seems that that the Rev Waters overspent on his repairs as the next Vicar, Rev Hodgson, wrote to the Dean and Chapter that he felt it was a pity that the Rev Waters did not spend on building a new Vicarage but instead spent £1100 on the old house. The loan Thomas Waters had raised was not paid off until September 1919, long after the building repaired with the loan was pulled down. The mortgage had been extended for an extra 15 years by the Governors of the Queen Anne’s Bounty. By 1891 the Rev Hodgson was suggesting to the Dean and Chapter of Christ Church that it would be sensible to build a new Vicarage at Thornbury than to repair the old. On 27th February 1891 Messrs Castle, Field and Castle confirmed the Diocesan Surveyor’s adverse report and said the original house had been much smaller and that it had been enlarged. It was badly built and drained and that it would be much better to build a new house than repair the old one. Hodgson wrote another letter on 21st April 1894 that suggested an existing house should be bought instead of building one. The old Vicarage could be sold for £2300 and part of the glebe for £2900. He enclosed a plan of the site of the suggested house. By 29th May 1894 it had become clear that the owner of the house proposed for the new Vicarage was Admiral St John and he had now raised his asking price from £2200 to £3000. This increase was unacceptable. We do not at present know which house this was. At that time Admiral St John owned several properties including Stokefield House, The Priory and Clematis Cottage. We know that by November 1894 the work on the new vicarage was already well under way. The Gazette for November 17th 1894 reported that a young labourer who was working on the rebuilding of the vicarage in Thornbury was found guilty of stealing trowels and other tools belonging to Henry Vizard of Alveston. 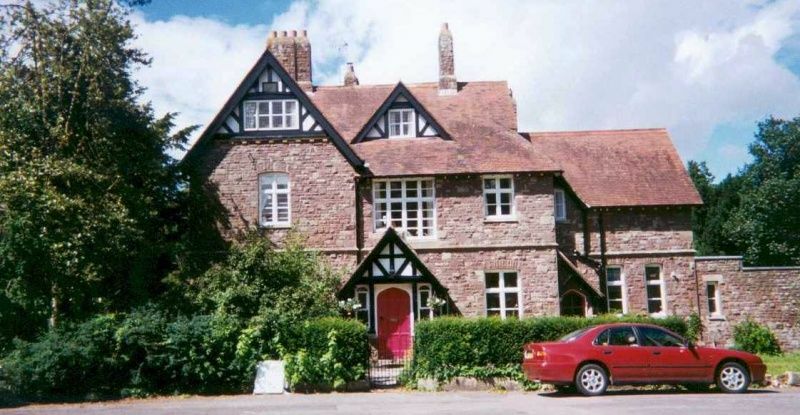 On 26th and 29th June 1895 the Bristol Mercury and Daily Post carried articles concerning the Vicarage in Thornbury. Both articles concerned a bazaar held during that weekend that was to raise funds for a new Vicarage. They explained that “the scheme for providing a new building was taken in hand about eighteen months ago and was forced on the parishioners by the previous Vicarage having been condemned as insanitary and unsuitable for the accommodation required of it”. We found this emphasis on the need for the new Vicarage arising from the short comings of the old one very interesting. We had previously been told by more than one source that the old Vicarage was destroyed by fire and this was why the new one was built. We have found no record of such a fire in the newspapers of the period and would like to hear more on this subject. The plans for the new Vicarage were drawn up by the Diocesan surveyor Frederick W Waller. 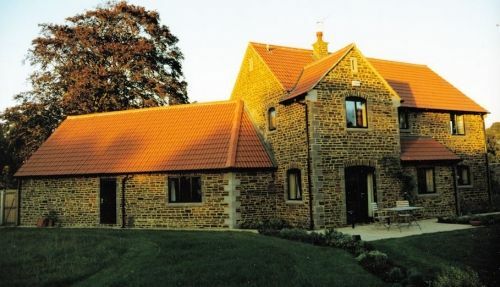 The new house was to be built of local sandstone and roofed with Brosley tiles. The newspaper reports of 1895 went on to say that as Christ Church no longer had an income from the tithes of Thornbury it was felt unreasonable to expect the College to foot the bill entirely for this new building. The problem was dealt with by public conscription. The total cost of the project was to be £1695 5s. The subscription list was headed by the Dean and Chapter of Christ Church Oxford who gave £300. Stafford Howard and W O Maclaine gave £100 each. The Vicar of the time Rev H B Hodgson gave £50 as did Earl Ducie. An ecclesiastical charity (Warneford) gave £450 and the Diocesan Association £80. In all by June 1895 £1480 10s 6d had been “promised”. There were to be a series of events to raise the balance, including a bazaar. The resulting building was the impressive house shown at the top of this page. The bazaar in June 1895 which was opened by the Countess of Carnarvon in the grounds of Thornbury Castle must have been one of the social highlights in Thornbury but smaller events to raise funds to pay for the vicarage continued. In November 1895 “the elite of the neighbourhood” apparently gathered in the Cossham Hall for a concert which included a choir of 36 people singing the cantata “The Wreck of the Hesperus” with the Rev C. R. Ward of Falfield conducting. The parish magazines for 1901 show that the fund raising went on. In November 1901 the Vicar was able to report “we rejoice to be able to chronicle the extinction of this debt, owing to the generosity of parishioners past and present.” The December issue was able to provide a final list of subscribers. The 1911 Census shows that the Vicarage had 16 rooms at that time (counting the kitchen but not the scullery, landing lobby, bathroom or office). On 1st August 1930 the Rev Claud Cotter obtained a mortgage of £44 from the charity called Queen Anne’s Bounty to improve the parsonage house and offices. We cannot be sure if the “parsonage” in this context means the Vicarage shown on this page or if this term refers to the older property opposite the church, now called Glebe Cottage. We have been lucky enough to be be sent the memoirs of a daughter of the Rev Cotter who spent a few years of her childhood in this house in the 1920s and was therefore able to give a description both of the house itself and of life there. She seems to have been quite impressed by the house and said that, “We had a rather nice house, fairly modern with a large garden and our own tennis court. It was next door to the church, and to Thornbury Castle“. She also gave a longer description of her social life at this time. It is evident from what she wrote that the Vicar and his family socialised very much with the gentry, even though they did not have quite the same status and wealth. She was very upset when she and her sister attended Thornbury Grammar School by the behaviour of fellow pupils and even the staff, arising from the difference in social class. The school was for tradesmen and not for gentry or professionals, who would have been privately educated or sent to what are misleadingly called “public schools”. The Vicar of Thornbury was very much placed amongst the gentry and professionals at that time. By the late twentieth century the Vicarage was seen as too large and expensive to maintain for the modern Vicar and his family. A new Vicarage in the ground was built in 1997 during the tenure of Rev Michael Vooght and it was officially dedicated on 29th November 1997. The photograph above on the left is the new vicarage. The old Vicarage was put up for sale and has since become a private house. We have a detailed description of the house at the time of the sale in 1997 and it seems in many respects not to have been altered very much from the time it was built. Please click on the thumbnail image above to see the full description. We have separate pages of information about the vicars of St Mary’s Church in Thornbury. The basis of this information was largely taken from the list of vicars on the board in the church itself but we have been lucky enough to see the records held by Christ College Oxford where extensive information about the church is held.